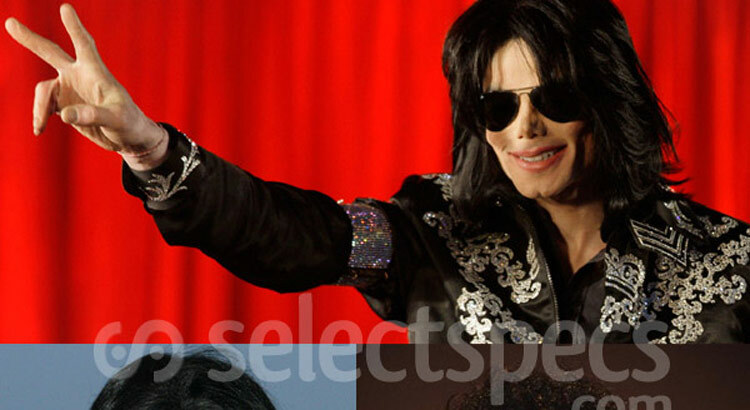 It has now been almost 2 weeks since the king of pop, Michael Jackson, passed away at his Los Angeles home reportedly from a cardiac arrest, and as a tribute to his life and career spanning over 40 years with over 750 million albums sold and countless awards including 13 grammy’s, we at SelectSpecs.com have decided to celebrate his life by looking back at some of the sunglasses (and glasses) he wore throughout his career. 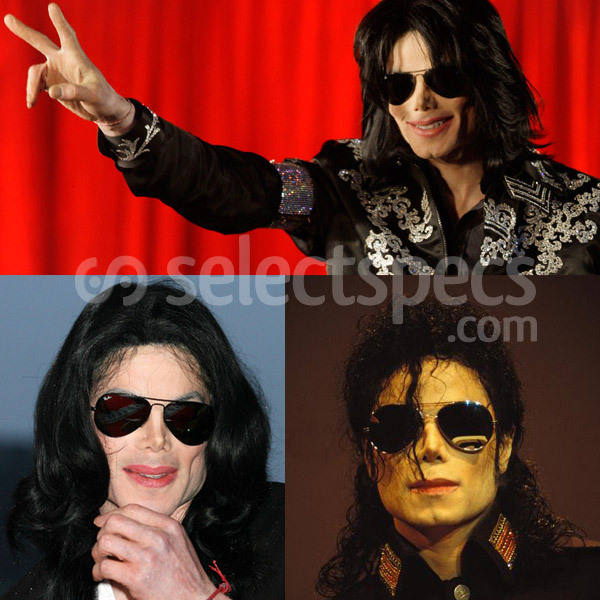 Jackson has regularly been seen wearing the popular Ray-Ban Aviator style frame throughout his career, including the Ray-Ban 3025. His most recent appearance wearing the Ray-ban 3025 Aviator sunglasses was at the news conference announcement for his upcoming tour “This is it” at London’s O2 Arena. Jackson has also worn an alternative to the 3025’s, the slightly bolder Ray-ban 3030 Outdoorsman. Jackson also went through a period of wearing the iconic Ray-ban Wayfarer, a style that every celebrity seems to love at the moment. Hmm. I didn’t know the King of Pop was in to aviators. Good man. I can appreciate him rocking the Wayfarers too. wow. lots of glasses. miss him soo much. 2 bad he passed away. please tell me! does anybody know where you can get these glasses?! i love them and ive been looking for them EVERYWHERE. Which glasses? we sell both the Wayfarer and Aviators on our website all linked to in the post above. 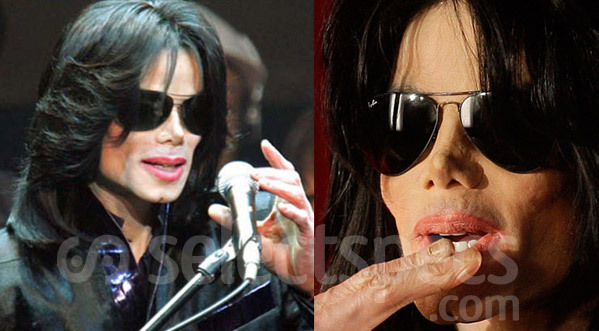 Were Michael Jackson’s sunglasses prescription glasses as well? 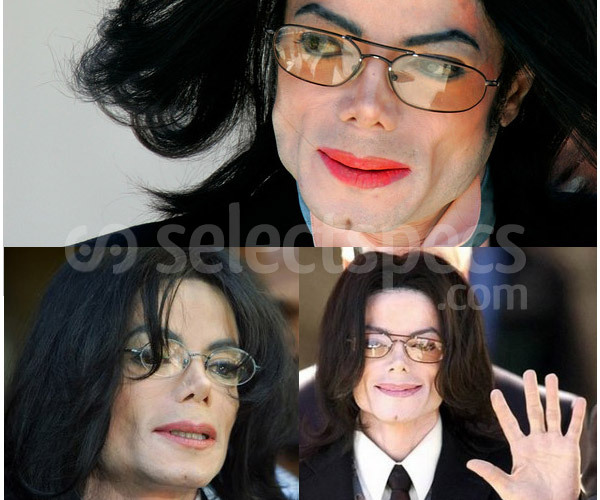 where can i buy the ones he had on at the news conference announcement for his upcoming tour “This is it” at London’s O2 Arena. We take our pictures using a light box, so they are lit from all angles including behind which makes the lenses seem lighter in our picture. The lenses will look darker to other people when you wear them because they won’t be lit from behind like they are on our website. The light box we use to take pictures of glasses lights them from all angles including behind. how can i buy the same colour ones he wears at the conference announcement for his upcoming tour “This is it” at London’s O2 Arena. What pair of sunglasses did he wear when he mets President Reagan. Okay can someone please tell me what kind of glasses he was wearing when he met president Reagan? 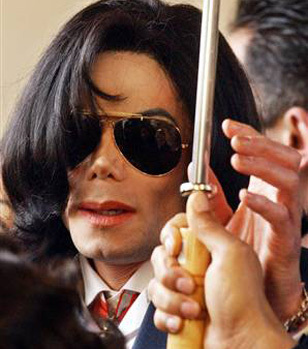 Where can I find the wayfarers just like MJ’s. Jake, the closest thing I could find to the 80’s glasses are Rayban Wings. Looks just like what he had on at the 84 Grammys. Hope this helps. Any other MJ fans out there planning to watch the TV Guide Network’s upcoming Michael Jackson special, Gone Too Soon, airing June 25th? I am really excited about it! Any body out there familiar with a pair of sun glasses that came out in the early 90's that featured Jackson's signature logo? It's a one piece lense and frame and the stalks actually fold into the frame and disappear. The ear pieces fold up as well All plastic definetley made in china comes in a green and black plastic case that clips onto your belt also signed only name on the is Monogram?